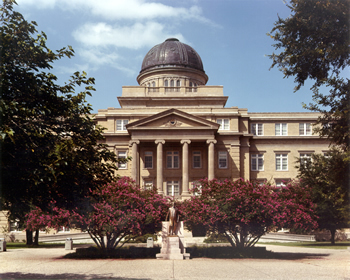 Texas A&M University (A&M) is a public research institution located in College Station, Texas, in Brazos County. With more than 50,000 students, Texas A&M is one of the six largest universities in the United States. Originally established in 1876 as the Agricultural and Mechanical College of Texas, the school has a proud history as the first public college in the state of Texas. Although the school was originally intended to teach farming and military arts to an exclusive student body composed only of white males, enrollment was opened to women and minorities in the 1960s. Communication degrees at A&M are earned through the school’s Communication Department. A&M offers a Bachelor of Arts in Communication, a Bachelor of Arts in Telecommunications and a Bachelor of Science in Telecommunications. A Master of Fine Arts and a Doctor of Philosophy degree are also available. In general, A&M takes a liberal arts approach to communication education, and the BA and BS stress principles and application evenly. Both undergraduate degrees are available with special emphasis on rhetoric and public affairs, telecommunication, organizational communication or health communication. A major strength of the MA and Ph.D. programs are small class sizes, emphasis on faculty accessibility and purposely flexible curricula geared towards allowing students to direct the focus of their own studies. Texas A&M produces a school newspaper, The Battalion. It was begun in 1893 and has been ranked number 5 among university newspapers in the United States by the Princeton Review. The school is also home to two radio stations, one of which is entirely student-run, and a PBS-affiliated television station. The school has been ranked as 49th in the nation by Forbes magazine. U.S. News & World Report ranked it 19th among public universities and number 52 in the nation, and Washington Monthly ranked it at 58th. Globally, Newsweek International placed it at 77th in the world. The school’s campus is in a suburban setting and is located adjacent to a college town. One out of five students lives in on-campus housing. “The Texas A&M tradition” refers to a long-standing code of conduct and a way of acting, speaking and behaving that many students still observe. Students can choose from more than 800 student organizations, including Greek societies, and nearly three-quarters of students choose to participate in at least one of them. All the school’s sports teams, as well as all current and former students, are called Aggies. The Aggies have earned a good deal of glory on the playing field. The football and men’s basketball team are particularly well respected, and they have won 18 and 11 Southwest Conference championships, respectively, along with a number of other significant victories.